Robeez's classic bootie is back to keep your little one warm on cold winter days and nights. These faux fur lined leather booties come in a variety of colors: Pink, Navy, Cream, Brown and Black. These boots are suoer cute and cuddly! Super comfy and soft. These are amazing! They stay on our baby girls little feet so well would definitely recommend them to anyone! J'adore ces bottines . Elles sont parfaites pour l'automne et les sorties en plein air. L'élastique étant un peu serré sur ce type de botte, j'ai prit une taille plus grande et c'est parfait comme ça. Overall these are pretty good boots. I got them to keep my baby's feet warm while crawling as our floor can be cold in the winter. I bought the 6 month size first as that is the right size for her foot length, but every time she wore them even for a short time she got deep red pressure marks on her ankles. So I bought the 12 month size, which is way too long and floppy for her foot length but is better around her ankles. However they do still leave marks if she wears them too long. My baby is much smaller than average and doesn't even have chubby legs or ankles so I can't imagine how these would fit a chubbier baby without hurting. Overall are flexible, warm and stay on well, I just think they would fit better if the elastic wasn't so tight. This was a replacement for a defective product and I'm really happy with customer service I got and the speed in which I received my replacement! This is the second time we have bought these boots. 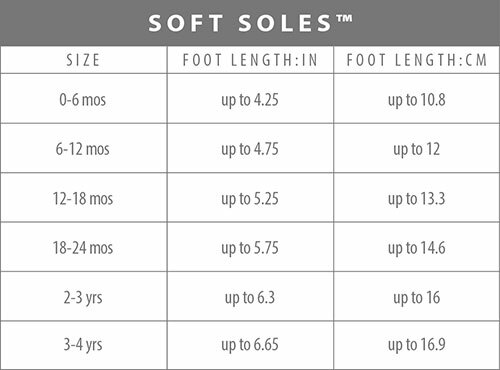 They fit our toddler comfortably and make great indoor shoes. Easy to put on, and they stay on (definitely not easy for a baby/toddler to yank off).